Dimensions: 22 x 17 1/4 in. This is the original drawing that was done in 1871 and given as a gift to Jane Morris, and it was the first work by DGR to be reproduced as a photograph, in 1877, through Frederic Shields and the Autotype Company. 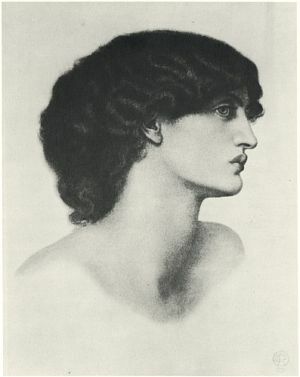 It was also the drawing that led DGR to plan a book of double works that would feature the image of Jane Morris: Perlascura: Twelve Coins for One Queen . The project did not, however, materialize. Surtees, A Catalogue Raisonné , vol. 1, 127 (no. 225). Surtees, Catalogue Raisonné , vol. 2, plate 323. Mills, ed., Frederic Shields, 204-206. Surtees, A Catalogue Raisonné , vol. 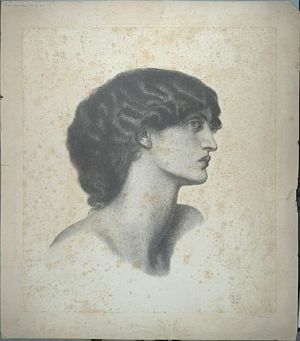 2, plate 323.